People interested in California High-Speed Rail issues frequently ask our organization – Citizens for California High-Speed Rail Accountability (CCHSRA) – for an accurate report about the status of California High-Speed Rail. 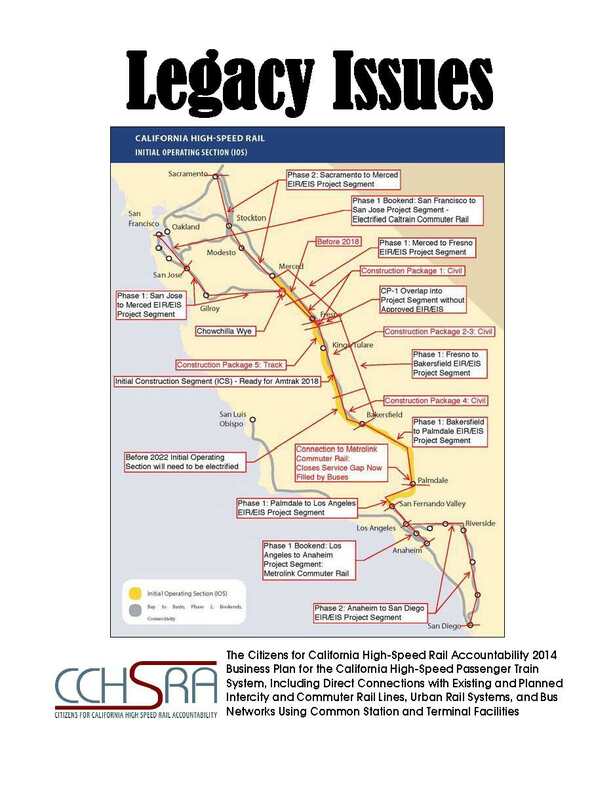 In April 2014, CCHSRA produced its own 110-page version of a business plan that tries to fulfill the requirements outlined in state law for a business plan of the California High-Speed Rail Authority. Select the link below for a realistic view of the California High-Speed Train Project: where it has been and where it appears the Authority is planning to take it. Frank Oliviera, co-chairman of Citizens for California High-Speed Rail Accountability, provides these encouraging words to all Californians (and Americans) concerned about how the most expensive endeavor in human history continues to advance in defiance of law. What is the Meaning of the October 15, 2014 California Supreme Court Decision? On October 15, 2014, the California Supreme Court denied petitions asking the court to review a disappointing appellate court decision that sided with Governor Brown and the California High-Speed Rail Authority. This outcome is a setback but certainly not the end of the citizen campaign to ensure accountability for the California High-Speed Rail project. The news media is mistaken when it echoes the triumphant claims of Governor Brown and the California High-Speed Rail Authority that this court decision is a major “go-ahead” for construction to start. It is not. This project is not inevitable and citizens on the side of the rule of law should not surrender to the interests pushing it. The appellate court decision simply said that the trial court (the Sacramento County Superior Court judge) erred in rejecting the California High-Speed Rail Authority’s FIRST funding plan. The appellate court declared that the first funding plan was simply notification to the California legislature before the legislature appropriated money for the project. The appellate court also said that the Authority COULD NOT USE or SPEND Proposition 1A bond funds UNTIL it had gone through the rigorous requirements and procedures of a SECOND funding plan. Without the ability to spend Proposition 1A bond funds, the Authority is still hindered in its plan to take land and direct its design-build contractor Tutor Perini/Zachary/Parsons to demolish buildings and prepare land and build bridges for actual rail construction in a few years. It will have to rely on limited revenue obtained through cap-and-trade taxes and other budget sources. It may also seek international government funding or perhaps even private investment. It is also important to remember that the appellate court itself said that the Authority FIRST funding plan was defective and deficient. These problems still exist, and the Authority will have to overcome them before approving a second funding plan. Therefore, there will be somewhat of a “repeat” of what has happened to date. Before borrowing and spending $8.5 billion authorized by Proposition 1A, the Authority has to prepare a detailed new second funding plan. This plan must meet requirements in state law to demonstrate adequate funding and environmental compliance. Then the California Director of Finance must approve the plan. Citizens will have an opportunity to file papers if there are legitimate legal reasons to oppose approval of the second funding plan by the California Director of Finance. If approval is granted for a defective and deficient plan, citizens can seek a writ of mandate from a court to stop the funding plan on the basis of its failure to comply with Proposition 1A. The appellate court said that citizens had the opportunity to do this when the ACTUAL SPENDING of the money is at issue. Meanwhile, a case is moving toward trial based on the California Code of Civil Procedure Section 526(a), a state law that gives taxpayers rights to defend their interests against injury. This lawsuit is separate, involves different issues, and is NOT AFFECTED by the appellate or supreme court decisions. A Sacramento County Superior Court judge has already rejected aggressive efforts to dismiss this lawsuit. Damaging evidence is being collected to introduce at the trial, which is expected to occur early in 2015. Once the evidence is determined, the court will establish a briefing schedule. The case will be briefed, argued, and then decided. The leaders of CCHSRA believe that the California High-Speed Rail Authority does not meet the requirements of Proposition 1A; in fact, the Authority CANNOT comply the requirements of Proposition 1A under its current business plan or under ANY plan. Few people are willing to admit this stunning truth in public: Proposition 1A was a poorly-written law, and the state legislators who are routinely honored for writing it actually doomed the project through their incompetence. As anyone can see from looking at the closed session agenda items of the board meetings of the California High-Speed Rail Authority, there are at least a dozen other major lawsuits originating from all over the State of California challenging the project. Some lawsuits contend that the Authority has violated environmental laws; a few challenge the constitutionality of the cap-and-trade taxes that are now a major source of funding for the project. In fact, the 2014 business plan for the California High-Speed Rail Authority is riddled with weaknesses, inadequacies, absudities, and failures to comply with the law. Hundreds of private property owners in the San Joaquin Valley are prepared to go to court to force the state to legally justify the taking through eminent domain of homes, ranches, farmland, churches, and small businesses. On the Peninsula, numerous parties are ready to file a lawsuit challenging a Final Environmental Impact Report shortly to be approved for the electrification of the CalTrain commuter rail. This electrification of the CalTrain rails is a precursor to high-speed rail trains sharing track with CalTrain commuter trains at the northern “bookend” of the “blended plan.” If you don’t remember voting on this blended plan, your memory isn’t failing: it was developed AFTER voters approved Proposition 1A. New outrages and schemes come to light at every California High-Speed Rail Authority board meeting. Proving yet again the value of the First Amendment, the press is constantly exposing what Governor Brown, his appointees, and some powerful legislators don’t want the people to know. The latest revelation is not a surprise to people who closely monitor the Authority, but nevertheless it is a stunning development. The Authority’s own experts and consultants (contracted through the engineering firm of URS) issued a report in September 2013 saying that the grade going south over the Tehachapi Mountains (between Bakersfield and Los Angeles) was too steep and the route for the Bakersfield to Los Angeles project segment through Palmdale was therefore infeasible. The Authority was ridiculously assuming that the high-speed train would coast down from the mountains to the San Joaquin Valley at 220 miles per hour. Reportedly these consultants/experts found themselves looking for a new job after writing this report. All along, Citizens for California High-Speed Rail Accountability has insisted that the Authority needs to choose a route along Interstate 5 through the Central Valley and through the Grapevine. Twice the Authority has rejected this alignment based on logic and instead chosen an alignment based on politics. Expect this report to be important evidence in the trial about taxpayer standing. The backers of California High-Speed Rail as currently planned have corporate and political power as well as taxpayer money and public legal resources. Governor Brown is intent on getting the project underway. The financial industry is eager for the bonds to be sold to investors. Construction and transportation conglomerates and their unions want the work and the money, now. Meanwhile, a small but influential group of intellectuals and activists regard the train as the centerpiece of a utopian vision for America in the 21st Century. A majority of Californians rightly see the project as foolish and misguided. Generally, the more people know about the high-speed rail project, the less they are to support it, at least as it stands now. Whenever you hear people talking about how “cool” the train will be, start by asking them if they know how much it will cost, how the state will get the money, where the train route will go, when the system will be completed, and how it will be secured. Finally, please join our group of ordinary citizens in staying the course and fighting for accountability on every aspect of this project. If we persevere, I am confident that we will achieve our goal of accountability, but it will take time and money. Don’t be discouraged! Please share this with any interested parties. 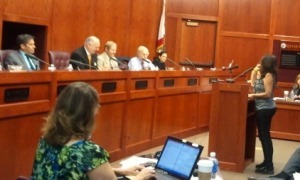 Shelli Andranigian speaks to the California High-Speed Rail Authority Board of Directors. On September 16, 2014, the California High-Speed Rail Authority Board of Directors held a meeting in Palmdale, where it plans to have a station and a possible connection one day to a high-speed rail line that goes to Las Vegas. Numerous people reported difficulty watching the meeting on the Authority’s video feed. One item on the meeting agenda is important to farmers in Fresno County. It did not get the news media attention it deserved. Below is a statement of Shelli Andranigian, board member of Citizens for California High-Speed Rail Accountability (CCHSRA), on the Authority’s meeting agenda item #8 to make findings related to Government Code Section 51292 (Agricultural Preserve/ Williamson Act) for California High-Speed Rail-related improvement locations in Fresno County. Good morning. My name is Shelli Andranigian and our impacted family farming operation is in the Fresno to Bakersfield section. Since I am also addressing many not familiar with the area, we are in the San Joaquin Valley aka the Central Valley in South Fresno County along the Cole Slough of the Kings River. I would like to know why you are addressing changes to The Land Conservation Act of 1965 also known as the Williamson Act as it pertains to farmland in Fresno County (Agenda Item 8). This topic should not be discussed or decided upon here at the California High Speed Rail Authority Board meeting today in Palmdale which is in Los Angeles County. Why is this important issue not being addressed in the Central Valley where farmers are in the midst of the busy harvest season and not able to be here which is two hundred plus miles away for them to publicly comment/question? Could it be because both Fresno County and the City of Fresno have each recently passed items unfavorable to the California High-Speed Train Project including a resolution to reverse their previously favorable stance of HSR by the Fresno County Board of Supervisors this past July 29th? Those in California’s Central Valley feed and clothe everyone in this room and the rest of the world. Farmers are the true environmentalists and stewards of the land. This action not only disrespects them, but everyone who cares about the environment. The California High Speed Train Project is not the “Green” project the Authority wants everyone to believe. I urge you to table any action on the Williamson Act (which will negatively impact over 70 properties in Fresno County) and bring it up at a future board meeting in Fresno. No mention of this action was even broached at the Fresno County Board of Supervisors meetings in July 2014 at which both CEO Morales spoke before the board one week and Vice Chair Richards at the next meeting or even at recent meetings. I am sure those here in Los Angeles County would not be pleased if a similar action impacting their properties was discussed in Fresno County at 9 a.m. on a weekday. Those behind-the-scenes at the California High-Speed Rail Authority have been in a rush to connect a train from San Francisco to Los Angeles, yet they have not yet planned on how to get from just north of Bakersfield to here in Palmdale. The Authority will need a rail line to traverse the mountainous Ridge Route aka Grapevine that bridges Southern California with the Central and Northern areas of our Golden State. Meanwhile, family farms, private homes, small and larger businesses, churches, schools, historical landmarks and the Fresno Rescue Mission which has been providing a home for the homeless since 1949 remain negatively impacted. Rogue appraisers, including those from out-of-state have been running rampant in the Central Valley. They have been harassing elderly female homeowners along with those who farm the land in the midst of the busy harvest season. The appraisers must be in a rush to get paid by the Authority before the funds run out! Those who ask the appraisers for more information so they can note the exact impacts to one’s property (by requesting a large and legible map), are not taken seriously and/or asked if said individual needs something for all impacted properties. Why would someone only need a large and legible map for property A and not for property B, C and D? A neighbor’s map sent by the appraisers even has the rivers near their farm labeled incorrectly. I’m not sure if the California High-Speed Rail Authority Board realizes the inept actions of those representing them on the front lines. The largest infrastructure project of its kind remains flawed because of continued missteps like those just mentioned. Who in California would want a train speeding through their communities at over 200 plus miles per hour when no thought continues to be put into the planning process at every level? It is high time to put the horse before the cart and hit the restart button to make it precise at every step of the way so those who prefer train travel such as myself will get to experience it in their lifetime in California. #NoOneWillBeAbleToRide until then. *CP means “Construction Package.” CP-1 is civil engineering (grading, drainage, bridges, etc.) in preparation to lay track between Madera and Fresno. The Authority awarded a contract in June 2013 for that construction package to a Tutor-Perini/Zachary/Parsons joint venture. CP 2-3 is civil engineering in preparation to lay track between Fresno and the border of Tulare County and Kern County. Three of five pre-qualified design-build entities reportedly plan to bid on this combined construction package. A winner may be announced by the end of 2014. Here is a press release from the legal team that argued against the California High-Speed Rail Authority. They argued that the Authority had violated some of the provisions of Proposition 1A and therefore could not borrow money by selling bonds as authorized by voters in 2008 under Proposition 1A. In November 2013, Judge Michael Kenny ruled that the High-Speed Rail Authorityʼs Funding Plan failed to properly certify, as the bond measure required, that all needed environmental clearances had been obtained and sufficient funding was available to complete the Merced to San Fernando Valley segment of the project. In addition, the appeals court reversed Kennyʼs ruling that blocked the issuance of bonds because of another failure to satisfy bond measure requirements. In California High-Speed Rail Authority et al. v. All Persons Interested, the appellate court held that no evidence was needed to show that it was “necessary or desirable” to issue the bonds – effectively erasing that provision from the ballot measure. Click here to access documents from the two cases. Three other claims in the Tos case are still pending in the trial court. Hanford, CA July 30, 2014 – Citizens for California High Speed Rail Accountability applaud the Fresno County Board of Supervisors for their decision Tuesday to approve both a resolution to oppose the California High-Speed Rail Project and file an amicus brief. Attorney Michael J. Brady came to both meetings to present fact-based testimony before the board, while the California High-Speed Rail Authority (CHSRA) was represented by CEO Jeff Morales on July 15 and Vice-Chair Tom Richards on July 29. Mr. Richards is also a Fresno area businessman and developer. The Fresno County Board of Supervisors resolution of opposition also stands alone as the only one in Fresno County on file re: the controversial train project. Any prior resolutions supporting the project from Fresno County will now be removed from the record. The vote was taken two weeks after the resolution to oppose the project was first presented by District 5 Supervisor Debbie Poochigian on July 15th. An amicus brief to support the Tos/Fukuda/Kings County Proposition 1A lawsuit against the California High-Speed Rail Authority (CHSRA) was presented by District 2 Supervisor/Chairman Andreas Borgeas at Tuesday’s meeting. 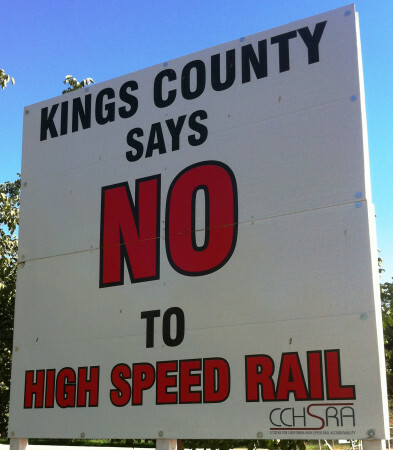 Citizens for California High Speed Rail Accountability (CCHSRA) is a nonprofit, nonpartisan advocacy group based in Kings County whose members reside in the city of Hanford and surrounding rural areas, along with other Californians who are affected by the high-speed rail. The group has been in the forefront since June 2011 attempting to get the California High-Speed Rail Authority (CHSRA) and its board to be in full compliance with Proposition 1A which the state’s voters passed in November 2008. Hanford, California June 5, 2014 – Today, Citizens for California High Speed Rail Accountability (CCHSRA), County of Kings and the Kings County Farm Bureau (KCFB) have been forced to file litigation against the California High Speed Rail Authority for violating the California Environmental Quality Act (CEQA) and other laws in their adoption of the Final EIR/EIS for the Fresno to Bakersfield Section on May 7, 2014. For over three years, these three entities have attempted to coordinate with the Authority to avoid and reduce environmental impacts from the proposed rail line. Unfortunately these attempts have been ignored as the Final EIR/EIS leaves numerous significant impacts unaddressed, provides defective mitigation measures, draws unsupported conclusions and defers analysis and mitigation measures to an unspecified time. The Authority’s failure to properly identify and describe this project in the Final EIR/EIS is a primary CEQA flaw. The rail line is only 15% designed or less so its extensive impacts to agricultural land, residences, businesses, and biological resources are poorly identified. New information presented in the Final EIR was not disclosed to the public earlier when it would have been meaningful. For example, air quality impacts from construction and soil movement will be much greater than disclosed, and the benefits of air pollution reductions will be half of what was anticipated in draft documents. Interference with nearby rail operations of BNSF are barely recognized, and not addressed. Based upon commitments by Chairman Dan Richard to the County of Kings in the Spring of 2012, our organizations were hopeful that we could address many if not all of our concerns prior to the adoption of the Final EIR/EIS. His commitment was to work with our communities to address concerns before releasing the Revised Draft EIR/EIS. Unfortunately, Chairman Richard never returned to Kings County and the Authority’s decision to brush aside our concerns and charge ahead has forced this litigation as our last recourse. Lastly, we are apprehensive that the uncertain fiscal stability of this project will yield severe and lasting impacts for all Californians that cannot and will not be mitigated. To date the Authority has not provided a clear and stable funding plan that would indicate that a true high-speed rail project can be completed and that all mitigation measures can be funded. Shrouded in the lack of transparency, lack of funding, and lack of accountability, we believe that the Authority will be unable to complete any functional rail project, let alone a high-speed one. For these reasons, CCHSRA, County of Kings and KCFB have concluded that litigation against the Authority and FRA is the last option that, if successful, will prevent catastrophic impacts to our community, environment and economy. For more information regarding CCHSRA please visit us at www.cchsra.org or contact Aaron Fukuda at (559) 707-8928. Hanford, CA May 8, 2014 – An attorney for Citizens for California High Speed Rail Accountability (CCHSRA) cautioned that a newly certified environmental document covering Fresno to Bakersfield will have serious ramifications if implemented. The second segment of the high-speed rail project for Fresno-Bakersfield was approved by the California High-Speed Rail Authority Board on Wednesday, May 7th in Fresno, California. Mr. Holder further warned of the implications of the Authority’s lack of sufficient funding. “Until the Authority can demonstrate that it has the funds to complete a project that provides HSR service from the Central Valley to Southern California and then to the Bay Area, the long-term and broader benefits will not be realized and the merits of the project will be in question,” he said. Citizens for California High Speed Rail Accountability (CCHSRA) is a nonprofit, nonpartisan advocacy group based in Kings County whose members reside in the city of Hanford and surrounding rural areas, along with other Californians who are affected by the high-speed rail. The group has been in the forefront since June 2011 attempting to get the California High-Speed Rail Authority and its board to be in full compliance with Proposition 1A which the state’s voters passed in November 2008. The 3rd Appellate District Court for the State of California announced on April 28 that oral arguments in California High-Speed Rail Authority et al. v. The Superior Court of Sacramento County are scheduled for Friday, May 23. This is the case which started when California Governor Jerry Brown, California Attorney General Kamala Harris, California Treasurer Bill Lockyer, and the California High-Speed Rail Authority asked the California Supreme Court under an extraordinary petition to allow the state to issue (sell) Proposition 1A bonds to fund California High-Speed Rail. (In October 2013, a Sacramento County Superior Court judge had blocked the sale of the bonds through two decisions ruling that the California High-Speed Rail Authority has failed to comply with Prop 1A.) The California Supreme Court wasn’t impressed: it sent the Governor’s petition to the appeals court where it belonged. While Governor Brown and a majority in the California legislature seem to tolerate the California High-Speed Rail Authority’s violations of state law, the judicial branch of California government recognizes that the Authority is failing to comply with Proposition 1A. On April 15, 2014, the California 3rd District Court of Appeal rejected an extraordinary appeal backed by Governor Jerry Brown, Attorney General Kamala Harris, Treasurer Bill Lockyer, and the California High-Speed Rail Authority. These top state officials wanted the appeals court to suppress two decisions of a lower court so the state could borrow money for the High-Speed Train Program by selling bonds. The Petition for Extraordinary Writ of Mandate or Other Appropriate Writ is denied. The standard of review for a judgment on the pleadings is the same as for a judgment following sustaining of a demurrer; we look only to the face of the pleading under attack. [Citations.] … All facts alleged in the complaint are admitted for purposes of the motion and the court determines whether these facts constitute a cause of action. [Citations.] (Hughes v. Western MacArthur Co. (1987) 192 Cal.App.3d 951, 954-955.) The parties’ motions for judicial notice are denied. RAYE, P.J. (RoBu) … Case Complete. Governor Brown and the California High-Speed Rail Authority wanted the court to disregard the promises the state legislature made to California voters when it placed Proposition 1A on the ballot. In their mindset, the vote of the people to authorize the state to borrow money for California High-Speed Rail overrides the burden to actually comply with the law. In fact, desperate supporters of the project are increasingly making this “democratic” argument. But we still live in a constitutional republic, not a democracy, and the courts will not allow the California High-Speed Rail Authority to spend money in a way that violates the law. It does not matter how many politicians or political activists support the bullet train or how “important” or “innovative” this $68 billion San Francisco to Los Angeles train will be for humanity. Ultimately, the California High-Speed Rail Authority will have to follow the law, ask voters to change the law, or shut down operations until new people are governing the state. What is Governor Brown Trying to Stop? High-Speed Rail Authority and High-Speed Passenger Train Finance Committee, for the State of California v. All Persons Interested in the Matter of the Validity of the Authorization and Issuance of General Obligation Bonds to be Issued Pursuant to the Safe, Reliable High-Speed Passenger Train Bond Act for the 21st Century and Certain Proceeding and Matter Related Thereto. John Tos, Aaron Fukuda, County of Kings v. California High Speed Rail Authority, et al. In addition, the same coalition has also won a court decision concerning the inclusion and consideration of arguments in Tos v California High-Speed Rail regarding the promised travel time requirements in Proposition 1A, such as 2 hours 40 minutes from San Francisco to Union Station in Los Angeles.